The building I would like to visit with you is one of the landmark examples of the modern architectural heritage of the formerly divided German capital. Built from Protected content 1964, it represents the central expression of architectural modernity in the German Democratic Republic. The list of political personalities who worked in the State Council building ranges from Walter Ulbricht to the former Federal Chancellor Gerhard Schröder. 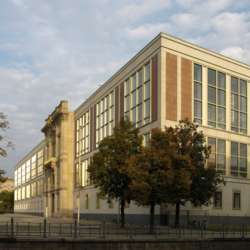 Today it hosts the number one business school in Germany. If you want to participate to this guided tour (in German), make sure you register online (see website link). Only those formally registered can take part to this public free guided tour!! !